Benefits: Chamomile is a widely recognised herb in Western culture and its medicinal usage dates back to antiquity. Its nutritional values are well established through years of traditional and scientific use and research. A common ingredient today in herbal teas because of its calming, carminative and spasmolytic properties, it is also a popular ingredient in topical health and beauty products for its soothing and anti-inflammatory effects on skin. It is used for the treatment of gastrointestinal complaints such as bloating, dyspepsia, impaired digestion, colitis, minor spasms, diverticulitis, infantile colic, flatulence, Crohn’s Disease and constipation in children. Chamomile is also indicated for gastric and duodenal ulcers, anxiety, restlessness, sleep disorders and mild cases of insomnia due to nervous complaints, menopausal conditions, migraine, children’s teething problems, vertigo (dizziness), travel and morning sicknesses, asthma, eye strain, urinary infections, diarrhea and symptoms of the common cold such as sinusitis, bronchitis, nasal congestion and hay fever. 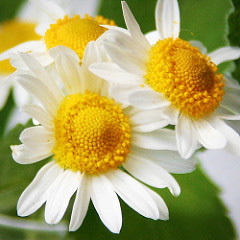 Topically Chamomile will treat inflammation and irritations of the skin and superficial wounds, skin cracks, eczema, bruises, sunburn, frostbite, small boils and haemorrhoids. The oil can be inhaled to relieve irritations of the respiratory tract due to the common cold. Active Constituents: Contains flavonoids such as apigenin-7-glucoside, apigenin and luteolin, apigetrin, apiin, quercetin, quercimeritrin and rutin; sesquiterpene lactones such as matricin; coumarins, such as herniarin and umbelliferone; spiroethers, phenolic acid; up to 10% mucilage polysaccharides; tannins; and essential oil components including proazulenes like matricin and matricarin. Then the other constituents include amino acids, anthemic acid (bitter), choline, polysaccharide, plant and fatty acids, and triterpene hydrocarbons (e.g. triacontane). Actions : Anti-inflammatory, antioxidant, antibacterial, antiviral, antifungal, mild sedative, cholagogue, bitter tonic (digestive), antispasmodic, spasmolytic, carminative, mild sudorific, diaphoretic, emmenagogue, antiulcer, relaxant, antiallergic, anticatarrhal. Pharmacological Actions: Anti-spasmodic, carminative, anti-inflammatory, analgesic, antiseptic, vulnerary. Contraindications: Even though it is of low toxicity, some allergic reactions have been documented. In patients with a known sensitivity to plants of the Asteraceae (Compositae) family such as ragweed, asters, marigolds, daisy and chrysanthemums. Pregnant women can use chamomile herbal tea however due to the lack of data any other chamomile preparations should be avoided. Not recommended to take high doses for longer period (approximately two months), it for renal transplantation patients.